2.0, starring Rajinikanth and Akshay Kumar, collect a little Rs 20 crore - Hindi version only - on the opening day, reported trade analyst Taran Adarsh. "Non-holiday release, non-festival period and yet, 2.0 takes a super start. Keeping in mind the fact that it's a dubbed film and the advance bookings opened very late, the business is strong. Thu Rs 20.25 crore (Hindi version)," he tweeted. Going by the film's pre-release hype, trade pundits thought 2.0 had a good chance to beat Thugs Of Hindostan's opening day collection number (Rs 50 crore in Hindi). However, Thugs of Hindostan's box office glory was short lived as the film's collection depreciated in the subsequent days - by and large because of the negative word of mouth reviews. As for 2.0, film critics have criticised the film's weak screenplay butthey've have put in a good word for the VFX and special effects, which is the heart and soul of 2.0. Non-holiday release... Non-festival period... 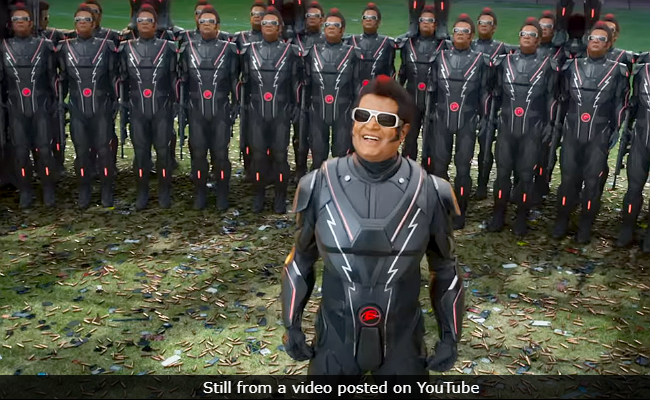 Yet, #2Point0 takes a SUPER START... Keeping in mind the fact that it's a dubbed film + advance bookings opened very late, the biz is STRONG... Thu 20.25 cr. India biz. Note: HINDI version. In his review for NDTV, film critic Saibal Chatterjee wrote: "Even for Rajnikanth, pulling this erratic, messy epic out of the fire is no cakewalk. He comes pretty close. Watch 2.0 for its scale and ambition, if not for the superstar who can do no wrong." He gave the film two stars out of five. 2.0 is the much-awaited sequel to 2010 film Enthiran, which was also directed by S Shankar and it featured Rajinikanth as the protagonist (Dr Vaseegaran) and the antagonist (robot Chitti). In 2.0, Chitti is reassembled by Dr Vaseegaran to fight Dr Richards (Akshay Kumar), an ornithologist who has turned against human beings. 2.0 also stars Sudhanshu Panday, Adil Hussain and Amy Jackson. The film's music is composed by AR Rahman.